Who qualifies as a referral? Any player who has not previously participated in our programs. Step 1: E-mail (girls) or (boys) the name of the person you are referring. 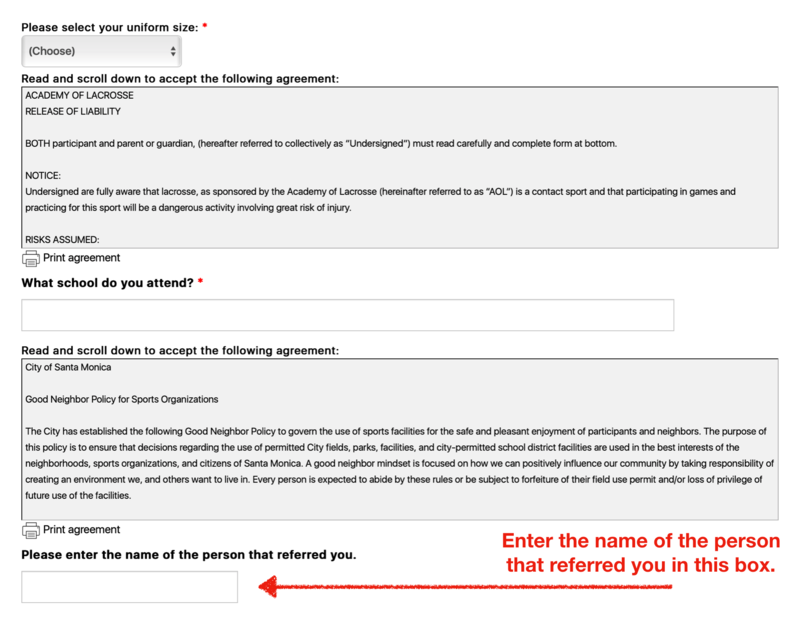 Step 2: Direct Referrals to the Registration Page. Step 4: Once your referral has registered and paid we will issue the referral credit to your child’s account. To make it easier for you to e-mail your friends, we’ve made a separate template for the winter girls and boys program below. TEMPLATE E-MAIL TO REFER GIRLS: Feel free to use this as a guideline or copy and paste. Subject: Come Play Dragons Girls Lacrosse This Winter With (Your Daughter’s Name)! I want to share with you a cool opportunity for your daughter to get involved with a new sport, have an amazing experience and build friendships that will last a lifetime! There is a really cute video HERE. It shows what it is all about and I am sure (your daughter - enter friend’s daughter’s name here) will love it! The Dragons Girls Lacrosse Winter Season will kick off in January 2019 in Santa Monica. The program is powered by a complete coaching staff of former NCAA Women’s Lacrosse collegiate athletes who love the game and are passionate about teaching young players how to succeed on and off the field. GAME SCHEDULE: Games will take place every Saturday starting the week of January 12th and ending the week of February 23rd & 24th. No games on January 19th. Games will be played at fields around the west side of Los Angeles, such as Mar Vista, Culver City HS, Santa Monica HS, and Manhattan Beach. PRACTICE SCHEDULE: Click the link below that applies to your daughter’s current grade level to view the practice schedule. REGISTRATION: Click the link below that applies to your daughter’s current grade level to register for the Winter Program! Registration Deadline is on Friday, December 21st. TEMPLATE E-MAIL TO REFER BOYS: Feel free to use this as a guideline or copy and paste. Subject: Come Play Dragons Boys Lacrosse This Winter With (Your Son’s Name)! I want to share with you a cool opportunity for (your son - enter friend’s son’s name here) to get involved with a new sport, have an amazing experience and build friendships that will last a lifetime! The Dragons Boys Lacrosse Winter Season will kick off with some pre-season training in December and get into full swing in January of 2019 in Santa Monica. The program is powered by a complete coaching staff of former NCAA Men’s Lacrosse collegiate athletes who love the game and are passionate about teaching young players how to succeed on an off the field. GAME SCHEDULE: Games will take place every Saturday starting the week of January 12th and ending the week of February 23rd & 24th. Games will be played at fields around the west side of Los Angeles, such as Mar Vista, Culver City HS, Santa Monica HS, and Manhattan Beach. PRACTICE SCHEDULE: Click the link below that applies to your son’s current grade level to view the practice schedule.